The exact date that Kihilla was built is difficult to pinpoint, but the original house is approximately 130 years old. Robert Fitzstubbs, a prosperous Sydney auctioneer, bought the land in May 1878, but sold part in July 1882, reserving the quarrying rights for a further year. It is believed that the Main House was built around this time, by his builder brother William. In April 1890 James Sutherland Mitchell, the Managing Director of Tooth’s Kent Brewery, became the owner and it was during his ownership that the West Wing, Stables and Coach House were added. 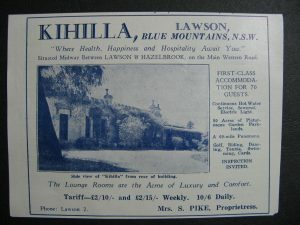 In 1913 he sold Kihilla to John and Annie Sulman. John Sulman was a prominent English architect, who had designed more than 90 churches in his homeland before moving to Australia. Locally he designed Springwood Church of England (Christ Church) and further afield, Armidale Boys School and the Women’s College at the University of Sydney. Sulman was prominent in the Arts, being President of the National Art Gallery from 1917 until 1934 and one of Australia’s first Town Planners. He is probably best known for establishing the Sulman Architecture and Art Prizes each year. Sir John died in 1934, but the property remained in the Sulman family until 1953, being leased mainly as a guest house. 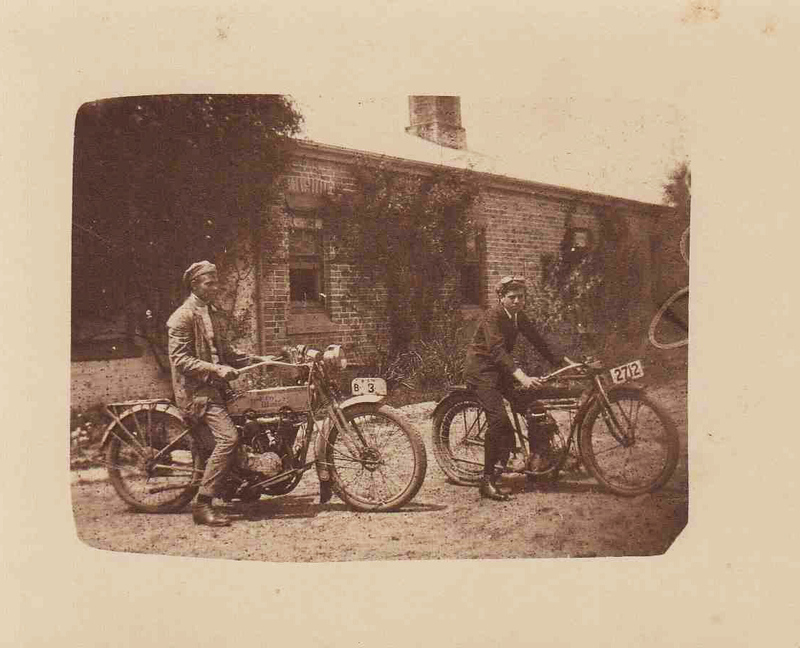 This photo shows the Sulman boys on their motorbikes in the stable courtyard, circa 1914/5. The last proprietor, Mrs Elsie McPhee, bought it from the Sulmans. In 1967 Mrs McPhee sold Kihilla to a trust which converted the property to a non denominational Christian convention centre. The grounds at Kihilla contain the vestiges of a grand garden and are of aesthetic significance, being inspired by the late nineteenth-century writings of exponents of the Arts and Crafts Movement – mature specimens of trees and shrubs, old steps and paths, large scale plinths of the type that form the bases for statuary or urns and informal walks through deliberately retained remnant indigenous vegetation. There are prominent, symmetrical plantings of Southern or Bull Bay Magnolia, both these, a coastal Redwood and a Brushbox are very large and almost certainly nineteenth century plantings. The main steps and pathway from the house are flanked with old Camellias, Chinese Holly, an old Japanese Maple, Rhododendron and Deodar or Himalayan Cedar. Some of these plantings and design are associated with the Sulmans.